Discussion threads are where your group can discuss a topic, exchange information and make decisions together. The Context panel contains the thread title, context and thread options. The Activity feed contains any updates to the thread. For example, if someone posts a new comment, or starts a new proposal, that activity will show up in this list. The Proposal section contains any current or closed proposals for that thread. You can start a new thread from anywhere in the app via the Action Menu. There is also a Start a thread button on the group page. The Start new thread form asks for a Title and Context. The Title is a succinct description of the topic being discussed. The Context is where you can share any background information your group members need to participate meaningfully in the thread. You can update the Context at any time, which can be a useful way to summarise a complex thread. 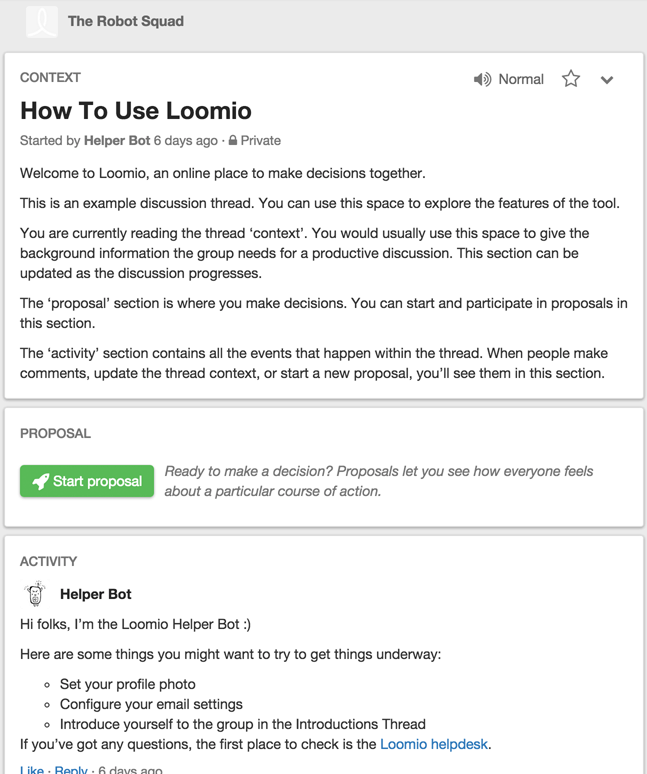 Loomio uses Markdown for text formatting. You can use Markdown in the context panel to format your discussion context, or to embed images. For more information on how to use Markdown, click the Formatting help link underneath the comment box at the bottom of the thread page to open the Markdown guide. If your group settings allow both public and private threads, when you start a thread you can choose whether it is public (publicly searchable), or private (only visible to members of your group). Group members can edit the title, context and privacy of any thread they have started. Group coordinators can edit the title, context and privacy of any threads taking place in their group. Group coordinators can also determine whether or not group members can edit each others’ threads (see Group settings). The Edit thread option is accessed via the thread Options dropdown menu next to the thread title in the thread page. Via the thread Options dropdown menu you can also delete, print, move, mute or change the email settings for that thread.